The Fireray 50R is a reflective type beam detector suitable for use with most modern fire alarm systems. This unit comes with a detectors, reflector plate and low level unit. The low level unit is designed so that the beam detector can be setup and controller from the ground. This means that the detector does not need to be accessed as often. 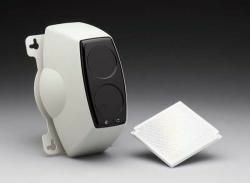 The Fireray 50R Beam Detector is suitable for use with Analogue Addressable, Conventional, Two Wire and Wireless Fire Alarm Systems. It is designed to be connected to these systems using an addressable interface for analogue addressable and wireless fire alarm systems. For conventional and two wire systems the Fireray 50R beam detector would be connected into the zone circuit. If you are interested in the Fireray 50R Beam Detector you may also be interested in our beam detectors range and fire alarms range.